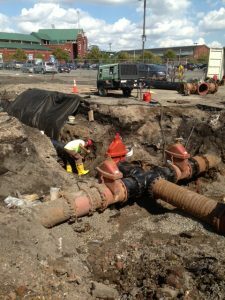 Cleaning pipes creates more room for sewage and stormwater. Fixing leaks reduces groundwater coming into pipes. This involves installing a device that releases a disinfectant into sewage before it overflows. This creates more room to treat sewage and stormwater at the plant so overflows happen less frequently. This creates a place for the stormwater and sewage to go until there’s room for it at the treatment plant. This makes two lines – one for sewage, which goes to the treatment plant, and one for stormwater, which drains directly into nearby waterways. Keeping stormwater out of the sewage treatment plant means the plant is never overwhelmed when it rains.